This morning we said farewell to Stuart and his family and boarded a train from Clarkson, the furthest station north of Perth, to Fremantle. A pleasant enough ride and quite cheap considering the distance covered. We changed trains in Perth but didn’t see anything other than the station so will have to go back sometime this weekend to explore there. 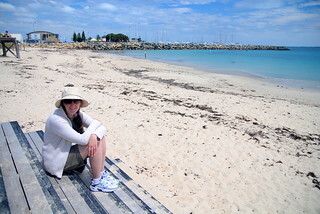 .Not really knowing anything about Fremantle I was plesantly surprised by what we discovered. Lots of beautiful old buildings and homes, most of them well restored and maintained. A thriving main strip of shops, cafes, bars and restaurants. There is a bit of an alternative, hipster feel to the town, kind of like Surry Hills by the sea. A late breakfast was had at the Ottong and Lincoln cafe as our body clocks continue to refuse to adjust to the timezone change. We then wandered through town and checked out the Shipwreck museum – Gemma will write more on that shortly. In the afternoon we stopped by the Seaview Hotel, the local of our new hosts Gary (Gemma’s brother) and Jill. Kimberley, is running the kitchen at the Seaview so we enjoyed a refreshing ale while waiting for her to finish up after the lunch trade. It’s a great little pub with a really nice bistro area that is currently struggling to find a working formula (and a dependable workforce). The evening was spent sitting around Gary and Jill’s patio amongst their rose garden catching up over a few drinks and a bbq dinner. Great day. Looking forward to tomorrow. Next Next post: Mutiny, murder and mayhem!